The Chicago Marthon was finally here! 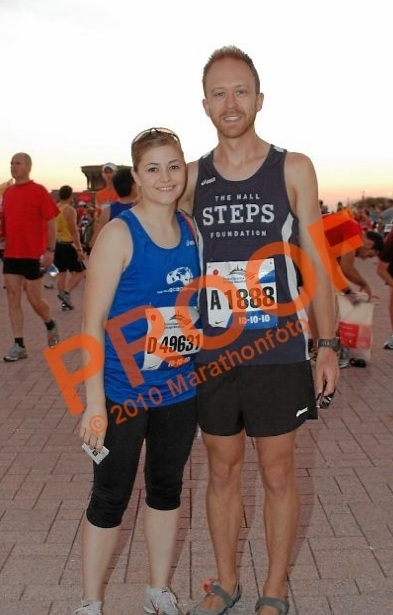 We raised enough money for the charity, The Hall Steps Foundation, and we were ready to run. We left from Ohio bright and early Saturday morning, and made the 5.5 hour drive into Chicago. We went to the expo Saturday night, and picked up our bibs and t-shirts. The expo was PACKED - and we could hardly move inside the Nike merch booth. After walking around the expo for a while we decided to take our stuff to the "hotel". (Erica's step-sister and husband were nice enough to let us stay with them). We then took off for the Steps dinner in downtown Chicago, where we were able to eat a great meal, meet all the other Steps runners and even meet Ryan and Sara Hall, Bart Yasso and Scott Bauhs. It was great encouragement for the race and we were pumped! After the dinner we headed back and got to bed. We got to the starting area around 6:40 and checked our bags and started to navigate and figure out where we were supposed to go. We finally figured out where the corrals were; I headed to 'A' and Erica went to 'D'. We said our goodbyes and good lucks and made our separate ways. I was glad to be in corral A, as it was not as packed as the open division and I was able to get across the starting line in around 30 seconds. I thought that it might help me reach my goal of running under three hours. The main reason I wanted to break three hours is because it would allow me automatic entry into the JFK50, rather than entering via lottery. The first few miles flew by, and I ran faster than I should have. First three miles went by in 6:09, 5:51 and 6:22 - hit the 5k point in 20:08. The crowds were great and made the race a lot of fun. The next three miles I was starting to warm up and ease into a better, more consistent pace - 6:30, 6:35, and 6:35 - 10k point at 40:51. The further we went the more spread out everybody got, which was nice because I didn't have to worry about stepping on heels or getting run over (as much). The next seven miles really seemed easy and I maintained a nice pace, 6:38, 6:37, 6:43, 6:41, 6:38, 6:43 and 6:41. At this point we were back downtown and the crowds were crazy! 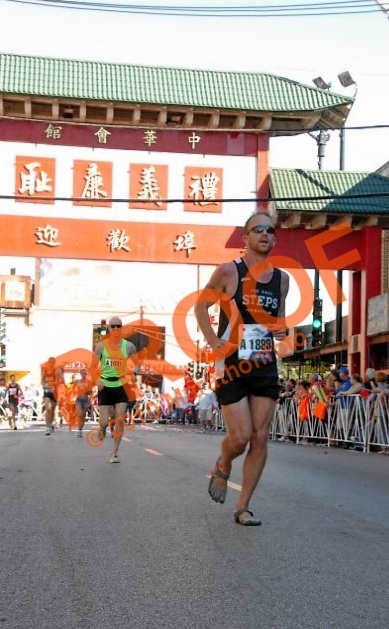 I went across the 1/2 marathon point at 1:27:16, which was faster than two of the four half-marathons I have done. The Chicago course is known for being flat and producing fast times. I was feeling great and it seemed like sub-3 might be a possibility! I knew that there was a long way to go still and it would get tough, especially since it was already over 70 degrees. 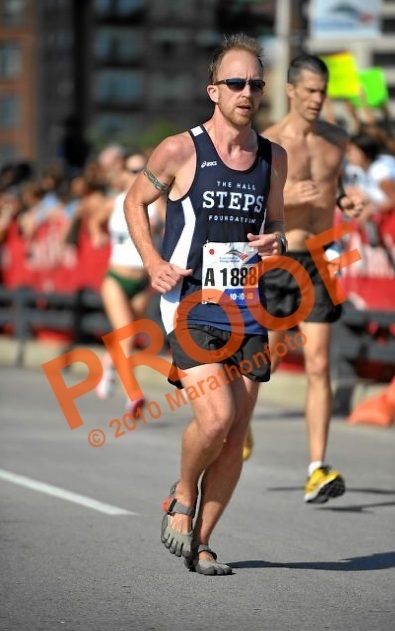 The next three miles were definitely slower, and were probably the hardest of the day - 6:59, 7:03 and 7:10. Ok, 5k left to go and still a little bit of a buffer left to hit the goal time. I had to do the last 5k in around 26 minutes to hit the goal time. Miles 24 and 25 were really tough, but was able to get them done in 7:15 and 7:07. From here I knew that I had 1.2 miles left and I really had to get moving if I wanted to be under 3 hrs... 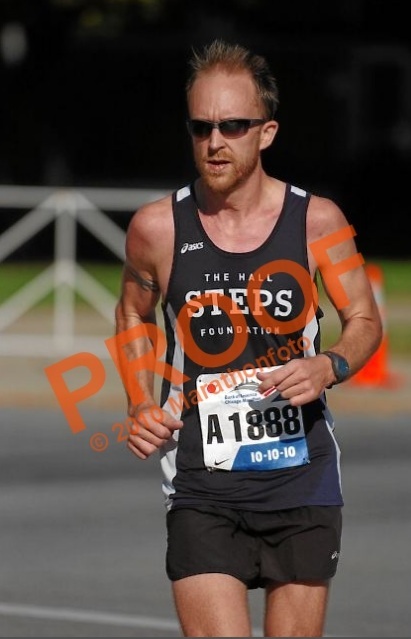 I was able to call upon some untapped reserves and picked up the pace - mile 26 done in 6:53. By this point the finish line was calling my name and I was running as fast as I could - climbed the small hill before the last turn. I heard the announcer saying "45 seconds clock time before the three hour mark!!!" 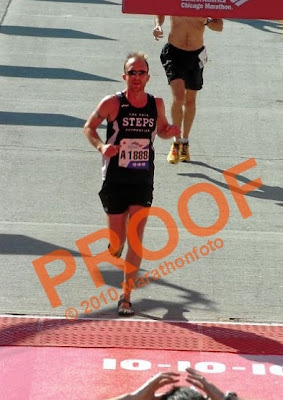 At this point I knew that I was going to be able to make it- crossed the finish line at 2:59:44 gun time, and 2:59:10 chip time. Fourth marathon in the Vibram Five Fingers - next up is the Bobcat Trail Marathon!